I came upon the Creative Yarn blog the other day. She designs and makes crochet/knit garments and accessories that are absolutely beautiful and unique. I was so inspired that I wanted to try to make a necklace from her free patterns. The necklace has flowers in it and I've never crocheted a flower before. 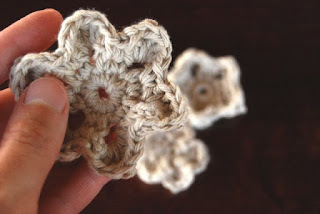 So I practice crocheting flowers with the many pattern links at Crochet Pattern Central. The practice flowers turned out not too bad. I thought I would do something with them. Added a button to one of the large flower. 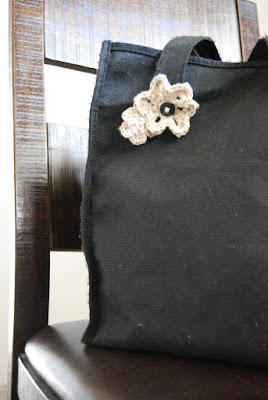 Sewed a smaller flower to it. Attached a safety pin on the back. 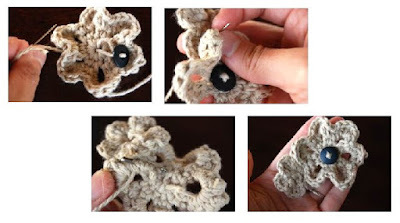 And I got myself a crochet flower brooch. A nice added touch to a simple reusable bag from a grocery store. i cant believe you! youre crazy! your mind is too creative. i definatly lost out on ALL the good genes!! !